For a simple day out and about, this casual outfit did the trick. I wouldn't call it particularly stylish but cozy it was. What made me feel best was the lilac colored cardigan and my Curtis Kulig x UO beanie. The weather in SF is dramatically different than what I had while I was in LA. Looking at these shorts makes me cold as I sit right next to heater. the color of that cardigan is so pretty! It pairs great with the more masculine beanie and shades. Love this casual outfit, especially that purple cardigan! And I love your arm party! Love how you always combine the perfect amount of casual and chic. i am loving this look, casual but still perfectly done up. Love this shade of purple on you! I love your necklaces - they're really cool. Love it, and the color of that sweater. I definitely don't wear enough lilac. Love the color on you! Oh my, I love this! I love when people mix casual pieces with fancy jewelry or other fun touches. It makes the outfit totally unique and cool. You look so effortlessly wonderful! This is so cute, and I think it is stylish! Mixing dressy jewels with casual clothes isn't always as easy as it seems :) Love it! The purple cardigan is so cute! Great color for you. I am an accessories girl too so I appreciate all of them! I just got a cardigan in that same exact color (in fact I'm wearing it now! ), and I'm obsessed. I think it's gonna be my color of the season! Looking adorbs, as always! I love the leopard watch! I saw this on my phone and wanted to check it out on my computer as soon as I got home! I love this mix of casual cool and girly pieces! Oh man, I love those bangles! Jillian - PS, if you have a moment, I'd love to invite you to check out the giveaway for a $50.00 giftcard to Shabby Apple! Great look and oh, so casual chic! You look wonderful in that beautiful cardigan and I love the beanie! loving how you're mixing all kinds of styles. very nice. nancy, the color of that sweater is so pretty. i love lilac. looks great on you doll. Those mirrored sunglasses are awesome - they lend instant edge to any outfit! 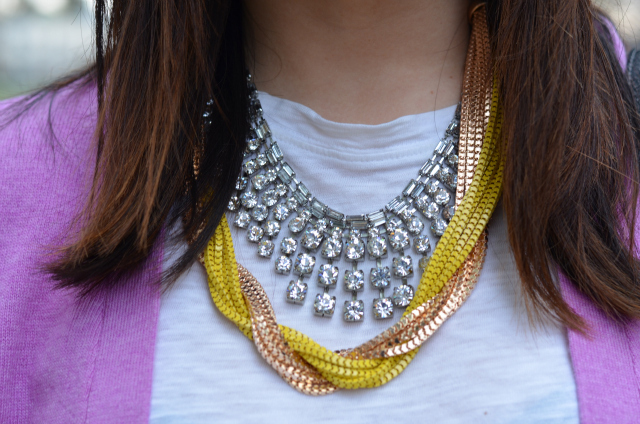 I really love both your necklaces and the way you've layered them - so fun! well done with your jewelry layering! and sometimes being warm and cozy takes priority over fashion! 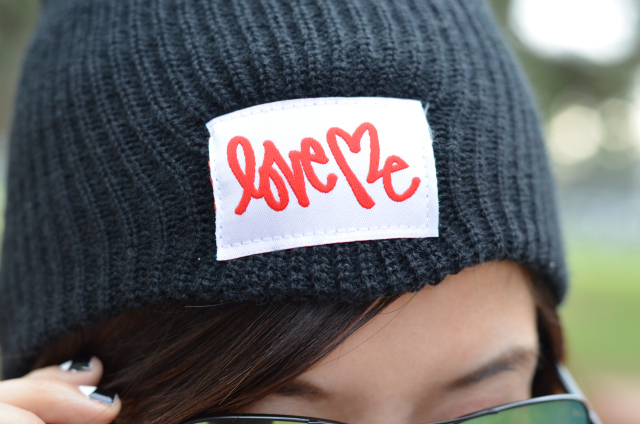 Your hat is awesome and I love that long cardigan! Great look! oh, nancy. i just love you! we think so much alike! i just bought the f21 necklace when i got to hawaii! Love the purple cardigan Nancy! Okay, so I need a pair of these glasses. They're so cool!